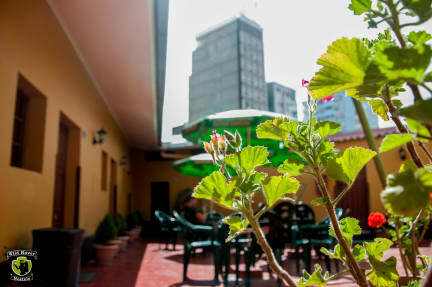 To all our valued potential guests, Wild Rover Hostel is the place to be when visiting La Paz, Bolivia! Officially recognised as one of the worlds new ‘7 Wonder Cities’, we are perfectly located 3600 meters above sea level in the city centre, making our base the perfect place for exploring this amazing capital! With great comfy accommodation, all round tasty food, three sunny patio chill-out areas and a cosy TV room, when you’re not rocking it out in our famous Irish bar, you can relax, get some you time and enjoy the company of your fellow backpackers. Truly committed to catering to your every need, upon arrival you can look forward to receiving great customer service, with a team of Reception staff available 24-7 to help you with all your queries and ensure your having a pleasant stay. We aim to remain the number one hostel destination, offering the best service and fun social party nights. Your stay is important to us, so please know we are always open to hearing your comments and suggestions. We look forward to the prospect of you joining us, as we promise to ensure your stay at the Wild Rover is one to remember! Irish owned Wild Rover Hostel has everything you need to enjoy this beautiful city. Once home to Bolivia's presidents, our 120 year old house has been renovated from top to bottom to give you all the facilities that are hard to find in Bolivia, in a safe and fun environment. So after that white knuckle Bolivian bus ride, check-in and chill out with us. Enjoy a real hot power shower (24 hours a day) which are not wired to the mains, the comfiest beds in South America with winter/summer duvets and backpack lockers in your room for your security. With the friendliest local English speaking staff, they are dedicated to helping you with all your needs, alongside in-house travel agents available everyday to assist you with the booking of all your trips, bus tours and flights. In our real authentic Irish bar, with a breakfast, lunch and dinner menu, nightly drink specials, plasma TVs and regular social events, you can be sure to indulge, catch the news and sports channels, socialise and most importantly have fun. Other common areas include our cosy bean bag TV room; with all the latest DVD's and cable TV, and our sunny patio areas, where you can catch up on your books or just chat with fellow travellers. On-site we provide 24hrs free internet and Wi-Fi, with strong connection in most areas of the house. Check-in is at 2pm and check-out is at 1pm, so if you are arriving early in the morning and you would like a bed before 2pm you will need to book for the previous day and inform us on your arrival time. We advise you book ahead to avoid disappointment and we can guarantee you a great time in La Paz. - All payments must be made in local currency (Bolivianos). - Due to security reasons, Wild Rover Hostels does not allow guests under 18 years of age. Your reservation is held for up to 2 hours after your estimated arrival time. After this we cannot guarantee your reservation. For group bookings (more than one person) in shared dorms, we cannot guarantee that all your group will be together in the same room. We will always try our best to accommodate your group as best possible but sometimes depending on circumstances it is out of our control.